Forest borders, clearings, moist forests and floodplains. The calyx lobes, besides running a little longer than in A. nepetoides, are also more narrowly lance-acute, less veiny, and less firm in texture; however, these are rather subjective characters. 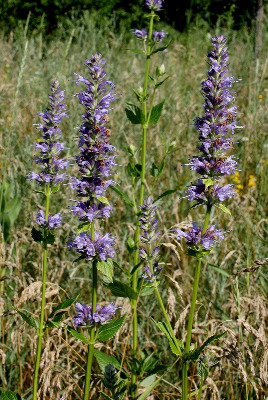 Agastache scrophulariifolia does have a somewhat larger inflorescence; when pressed the larger inflorescences (calyx tip-calyx tip) are ca. 14–20 mm wide, those of A. nepetoides generally run 10–16 mm wide. MICHIGAN FLORA ONLINE. A. A. Reznicek, E. G. Voss, & B. S. Walters. February 2011. University of Michigan. Web. 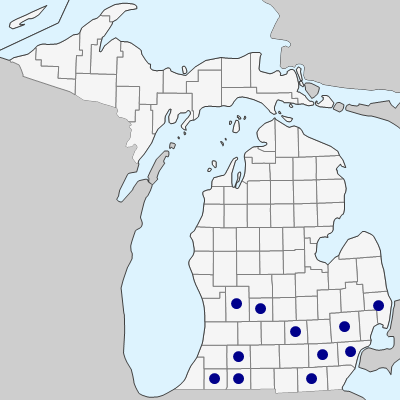 April 20, 2019. https://michiganflora.net/species.aspx?id=1534.